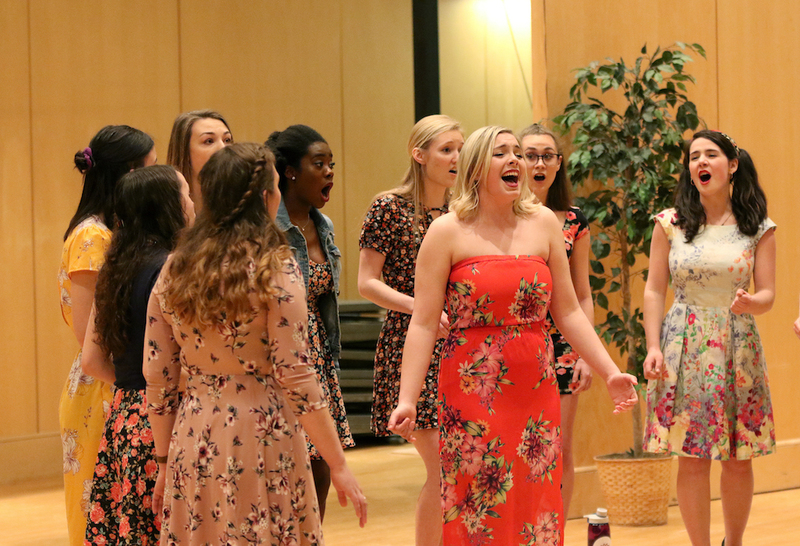 All-female a cappella group Renaissance hosted a spring showcase on Saturday, April 28. Photo by Matthew Lavoie, Staff. UMaine Renaissance is an a cappella group made up of 11 women from University Singers. They performed 15 songs which included Sia’s “Chandelier” and Cyndi Lauper’s “Girls Just Wanna Have Fun,” and many other well known songs from throughout the decades. Dressed in all florals, the girls welcomed spring with the audience of family and friends. Their new album, “Be Right Back,” is composed of their eight favorite songs, including VV Brown’s “Shark in the Water” and The Zutons’ “Valerie.” Every member of the group is featured on the album in solos. It can be purchased at any of their events or through their Facebook page for a suggested donation of $10. The album will also available for streaming on Spotify. Gwen Hill, a fourth-year music education student, joined UMaine Renaissance for the learning experience but gained a friend group in the process. She now serves as the group’s Head Music Director and President. The group is made up of female students from across campus that have a passion for singing. After seeing her roommate perform as part of the group, Bryce Smith, a second-year biology student, was inspired by their sound and wanted to join. Now she is known for sharing biology facts at random during rehearsals. In addition to their concerts, the group does many on campus performances at events such as Take Back the Night and the Out of the Darkness Walk. They are also frequently invited to perform at both public and private events in the greater Bangor area. Renaissance has acquired over 100 alumni since it began in 1999 including former Senator Emily Cain, a founding member of the group. At their concerts they perform their alumni song, Timshel by Mumford and Sons, and invite their former members to sing with them once again. Alumna Dana Douglass joined the group on stage last Saturday. Renaissance also welcomed The Maine Steiners to their showcase, and invited them to perform three songs after the intermission. Renaissance will be making an appearance at their show on Monday, April 30, at 7:30 p.m. in Minsky Hall. “Our goal is very similar to the University Singers. We hope to instill in the audience that you can and should keep music in your life forever,” Hill said. Whether they are performing in high schools across the state on tour or on campus for their peers and former members, Renaissance reminds their audience the importance of engaging with music. Follow their Facebook page to find more information on their new album or for updates during their spring tour in May.